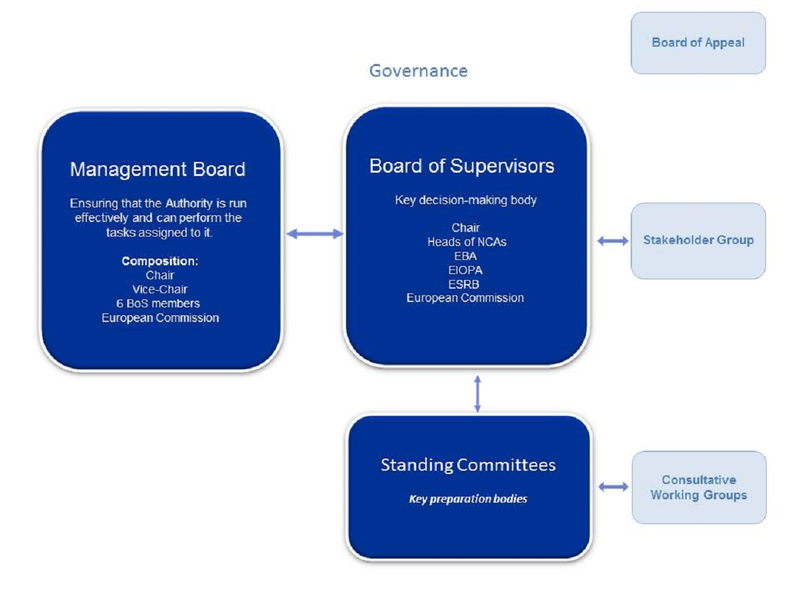 ESMA is led by a senior management team consisting of a full-time Chair, Steven Maijoor, and an Executive Director, Verena Ross. The Chair is responsible for representing the Authority. The Chair prepares the work of the Board of Supervisors as well as chairing both the Board of Supervisors meetings and those of the Management Board. The alternateto the Chair is the Vice-Chair. The Executive Director is responsible for the day-to-day running of the Authority, including staff matters, developing and implementing the annual Work Programme, developing the draft budget, and preparing the work of the Management Board. The Management Board (MB) which ensures that the Authority carries out its mission and performs the tasks assigned to it in accordance with the ESMA Regulation. In particular it focuses on the management aspects of the Authority, such as the development and implementation of a multi-annual Work Programme, as well as budget and staff resource matters. The Board of Supervisors is supported by a number of Standing Committees and working groups who deal with technical issues. These are chaired by senior national representatives and bring together the national experts in specific fields for the purposes of developing policy. They are supported by staff of the Authority, and work with the aim of strengthening the network of regulators in a given area as agreed in a tailored set of terms of reference. These are groups of market participants (practitioners, consumers and end-users) set-up to provide technical advice to the Standing Committees and are drawn from across the EU. They do not represent national or a specific firm's interests and are complementary to the normal consultation process undertaken by ESMA in developing policy. The Securities and Markets Stakeholder Group (SMSG) was established under the ESMA Regulation to facilitate consultation with stakeholders in areas relevant to ESMA’s tasks. The members represent: financial market participants and their employees; consumers and other retail users of financial services; users of financial services; and small and medium sized enterprises. ESMA is required to consult the SMSG on its draft technical standards and guidelines. The Board of Appeal is a joint body of the European Supervisory Authorities (ESAs) and has been introduced to effectively protect the rights of parties affected by decisions adopted by the Authorities.